Day. Night. Rain, hail or shine. Then you’re going to need to buy yourself a mini indoor basketball hoop. Whether it’s for a bit of fun, or for the younger people in the house, finding the best over the door basketball hoop is a worthy investment for any basketball-crazy fan. The following hoops are all some of the best selling on the market. They’re also rated in terms of PRICE, DURABILITY, and OVERALL QUALITY. No one wants to waste their money on bad products. We note that all these basketball hoops are mini to small. The size of the basketball ranges between 4″ to 6″, and are usually made with soft rubber or foam. Similarly, all these hoops are to be hinged on a wall or door. They won’t stand up by themselves. If you don't have a budget, then this is far and away the best pick. If you’re looking for true value for money, that looks and performs like a real sized hoop, then the SKLZ Pro Mini Basketball Hoop is a serious contender to be the best indoor basketball hoop for you. Breaking down each element, the rim is made with steel for increased durability. This is encompassed with a spring action break away on the rim which will allow players to dunk on the hoop without needing to worry about breaking it. This is a product made to last. In terms of setting it up, this particular mini indoor basketball hoop will fit on either a wall or a door. You can still close a door if you mount this on one. However, in our opinion, mounting this on a stable wall will be a much better alternative than mounting it on a door. Especially if you’re going to dunk. Finally, this indoor basketball hoop is supremely affordable. It won’t go anywhere close to breaking the bank, and it comes with a 5″ small basketball. If you think the normal sized over the door hoop is too small, SKLZ also sell a XL size which is slightly bigger. It’s hard to go wrong with this hoop. Very similar looking to its SKLZ counterpart, the Spalding NBA Slam Jam is another good mini indoor basketball hoop that won’t break the bank. A nifty thing about this particular hoop is that it is exactly 1/4 of the official NBA hoop size. That gives this indoor basketball hoop a nice sense of authenticity. This is in conjunction with the steel rim also being a break-away rim. Again, this means that the rim can be dunked on! However, if it’s on the list, why isn’t this the best over the door basketball hoop? In terms of versatility, it’s not great. You can only hook this up on a door. It won’t fit on a wall. Whilst this may not be a dealbreaker for some, it’s something any potential buyer needs to be aware of. Whilst only being able to be fitted onto doors, it’s also one of the very few hoops that will allow all doors to close. Some options out on the market have seen issues with unconventional door designs. The Franklin Sports Shoot Again Basketball Hoop is a completely different option to the standard over the door basketball hoops that you usually see being sold. In particular, this hoop is very gimmicky. 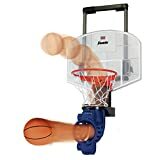 Franklin has created this mini basketball hoop with an automatic ball returning system that fires the ball back at your if you successfully make the hoop. Further to this, there is an electronic scoring system that is part of the set up that requires 4 C batteries. The electronic scoring system can be turned off, and the automatic ball returning system can be removed. In terms of the overall performance of the hoop, don’t assume it’s gimmicky nature carries over to it’s durability. The backboard is made with a plexi-glass that does take a bit of a beating. However, you won’t be able to dunk on it. This particular hoop only be hooked onto a door. 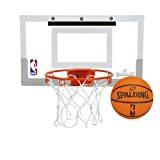 Whilst it’s not the most authentic feeling mini indoor basketball hoop available, this is a great gift idea for any basketball fan. Alternatively, a fantastic gift to get for younger children. The last on our list, whilst probably the best over the door basketball hoop, is definitely the most expensive. The RAMgoal Mini Indoor Basketball Hoop is an extremely tough and durable hoop that’s made to last. You pay for quality here. If you’re looking for an extremely durable mini basketball hoop for wall, RAMgoal’s option stands out. This is because of their the highest quality products they use in it’s creation, which also holds up surprisingly well in outdoor conditions. In particular, the rim is a breakaway rim made of professional grade. Yes, you can dunk on it. The hoop also doesn’t mount directly onto the wall. There is a frame (held up by 2 studs) that creates 22 inches of space between wall and backboard. It also has a HUGE backboard as well – measuring 24 x 16 inch made with powder coated steel and a shatter resistant acrylic backboard. This far exceeds the size of cheaper alternative brands. Finally, it’s important to note that the instructions in the package explains how to set it up on a drywall where there are studs located behind the wall. Locate the studs and you’ll have an extremely stable hoop. If you don’t have a budget, and you’re looking for the best mini indoor basketball hoop, look no further. 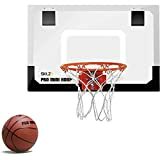 When looking to find the best mini indoor basketball hoop, there’s not a whole lot of differentiating factors between the different brands and options. Things you will want to consider, however, include factors such as PRICE, DURABILITY and PERFORMANCE. For example, the RAMgoal ticks all the boxes you could possibly imagine. The downside? It’s extremely expensive in comparison. Set yourself a budget, and buy accordingly. Also, if you didn’t want something so serious for younger children, then buying something such as the Franklin Shoot Again would work perfectly. Buy the right product to suit your personal needs. It’s extremely tough to pick and choose a product that we deem to be the best mini indoor basketball hoop on the market. However, if you want something that’s priced amazingly, and offers moderate durability and performance, then it’s so hard to avoid the SKLZ Mini Indoor Basketball Hoop. Like always though, do your own research, set your own budget, and make sure the product you purchase suits your needs. If we’ve missed a small indoor basketball hoop that you think should be on this list. Please let us know. We’re always improving on our database.